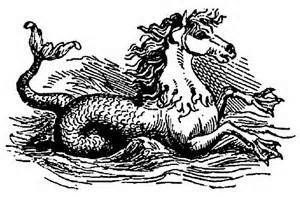 The mythical kelpie is a supernatural water horse that was said to haunt Scotland’s lochs and lonely rivers. One is recorded as being banished by St Columba from the River Ness. The river Conon (Conan) in Perthshire, which can be very treacherous in flood, was associated with dangerous water spirits. The kelpie would appear to victims as a dark grey or white pony but could be identified by its constantly dripping mane. The Scots word kelpie may be derived from the Gàidhlig calpa for “horse” or “cow”, or cailpeach, meaning “heifer” or “colt”. The first recorded use of the term to describe a mythological creature, then spelled kaelpie, appears in a manuscript composed some time before 1759. The creature could take many forms and had an insatiable appetite for humans. Its most common guise was that of a beautiful tame horse standing by the water. Anybody foolish enough to mount the horse would find themselves in dire peril, as the horse would rear and charge headlong into the deepest part of the water, submerging with a noise like thunder, and taking the travelers to a watery grave. Kelpies were occasionally benevolent. They looked kindly upon the millers, keeping streams running freely to turn the waterwheels at the mills. Kelpies warned of impending storms by wailing and howling, and could be heard howling through the tempest. The sound of its moving tail made the sound of clapping thunder as it submerged under water. Counterparts in some regions of Scotland include the shoopiltee and nuggle of Shetland and the tangie of Orkney. Kelpies are different from the lakeside-dwelling “water horse” (Gàidhlig: Each-uisge) which is far more vicious. The each-uisge, is found in the Highlands, and has been described as the fiercest and most dangerous of all the water-horses. While kelpies inhabit streams and rivers, the each-uisge lives in the sea and in both fresh and salt water lochs. The each-uisge is also a shape-shifter, and can disguise itself as a fine horse, a handsome man, or an enormous bird. If, while in horse form, a man mounts it, he is only safe as long as the each-uisge is ridden on land away from the water. At any glimpse or smell of water, the each-uisge’s skin becomes adhesive and its rider becomes a victim of drowning as it dives to the deepest part of the water. There, the rider is torn apart and devoured. When in human form, the each-uisge appears as a handsome man, but the discerning eye will see the water weeds, mud and sand in his hair. Because of this, Highlanders were wary of lone animals or strangers by the water’s edge. On the Isle of Lewis, near the fresh water loch, Loch-à-Mhuileinn (“Loch of the mill”), there is a knoll named Cnoc-na-Bèist (“hillock of the monster”) where an each-uisge was caught in the act of seducing a woman, and was slain by the woman’s brother. Tangie is the sea-horse in the folklore of the Orkney and Shetland Isles. The name comes from the Danish word tang, “seaweed”. Described as a rough-haired type of pony with seaweed or shells in its mane, a tangie can also shape shift to look like a merman. Tangies are also known for terrorizing lonely travelers, especially young women, who walk alone near the lochs at night, and devouring them under the water. Orkney is also home to the noggelvi or nuggle which could shape shift to any other creature, but usually took the form of a magnificent horse. Waiting patiently by the side of lochs, streams and ponds, it would capture any human that would approach it. The nuggle seems to be identical to the kelpie, and was called also called a shoopiltee on Shetland. In April 2014, 30-metre high horse-head sculptures called “The Kelpies” opened to the public at the Helix, a parkland project built to connect 16 communities in the Falkirk Council Area. “The Kelpies” name reflects the strength and endurance of the mythological beasts, which was said to equal that of ten horses. This strength and ability to transform represent the endurance of Scotland’s inland waterway system. “The Kelpies” pay homage to the horses that pulled the wagons, barges, coal ships and ploughs, and were intrinsic to Scottish industrial growth and shaping the geography of the Falkirk area. This entry was posted in Ancestry, Eco-travel, Ecology, Land trust, Scotland, Scottish ancestry, Self drive Scotland tours, Travel, Uncategorized, Women Writers and tagged each-uisge, Falkirk Kelpies, Kelpies. Bookmark the permalink.